2 Tablespoons finely chopped parsley. Place a large pot on a medium heat. Add the olive oil and onion. Saute the onion for about 5 minutes, or until it has softened and started to brown. Add the remainder of the vegetables, and saute for a further 5 minute or until the vegetables have softened slightly. Stir in the rosemary, sage, bay leaves and barley. Add the vegetable stock, season with salt & pepper, and bring to the boil. Reduce the heat, and allow the soup to simmer for about 40 - 50 minutes, or until the barley is cooked. Check the liquid level occasionally, and top up with hot water or more stock if the soup appears too thick. Stir through the chopped parsley, and check the seasonings. 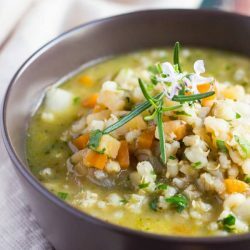 You can use any mix of root vegetables in this soup, although a larger variety makes for a tastier soup. Chop all of the vegetables into 5mm cubes, or not much bigger than a swollen barley grain. Barley readily absorbs liquid, and the soup will thicken considerably upon standing. Add a little more stock or water as the soup reheats to thin it out again. This soup freezes well, although it will be quite thick once defrosted. Just add a little more stock or water as you reheat it. The soup will last for up to three days in the fridge, and up to four months in the freezer.